It wasn’t until I started working in the food industry that I actually got to see a “puffing gun” first-hand. Sadly, it looked nothing at all like I had envisioned. It was rather disappointing, to tell the truth. The “gun” itself just looked like a large vertical cylinder with a bunch of pipes and valves sticking out. This was one more of life’s illusions shattered. Injecting a dose of reality, puffing guns are a cereal industry workhorse. The principle of their operation is not all that complicated. So, let’s take a look at how they function. Most raw ingredients for breakfast cereals are starch-based. Picture kernels of wheat or rice. Initially, the starch is very firm and is in what is called its crystalline form. You only have to try chewing on some uncooked rice kernels to appreciate what we are talking about here. Raw kernels need to be conditioned by soaking them in hot water before they can be puffed. With heating in the presence of water, the starch becomes gelatinized and begins to swell as it draws in moisture. In doing so, it becomes softer and more “plastic” in texture. The starch is now gelatinized. 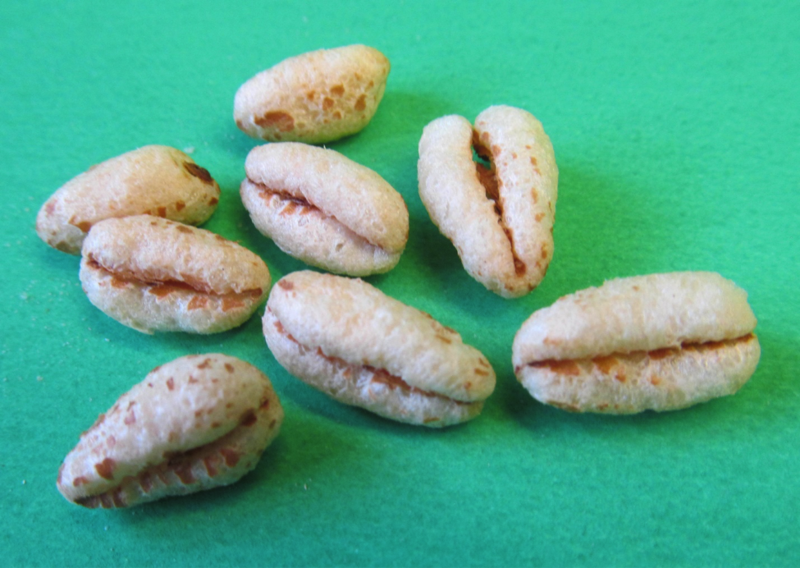 For puffed cereal in different shapes, a dough made from starch-based flour is pre-formed into the desired unexpanded form. These pieces will become gelatinized in the puffing gun. The heart of the puffing gun is basically a chamber that can be heated and pressurized with steam. Under pressure, the temperature of the steam in the puffing gun can reach over 120 degrees Celsius (i.e., over 250 degrees Fahrenheit). Inside the pressurized puffing gun at these temperatures, the water in the soft, swollen grain kernels or pre-formed starch pieces stays in its liquid form, even though it is well above its normal boiling point. After a suitable amount of time, the material inside the “gun” will reach these elevated temperatures, and the starches in the dough will be completely gelatinized. At this point, the puffing gun is “fired”. By opening a series of valves, the pressure inside the gun is vented rapidly to the outside atmosphere. The sudden decrease in pressure causes the extremely hot water inside the soft, starchy kernels or formed shapes to vaporize almost instantaneously. In going from its liquid form to a vapour, there is a substantial increase in the volume of the water. This rapid expansion causes the kernels or pre-formed shapes to expand to several times their original volume. Once in the air outside the puffing gun, the expanded pieces cool quickly and retain their puffed shape. If desired, the cereal can then be coated with a sugar syrup and dried. After cooling sufficiently, the puffed cereal heads for the packaging line. It then moves through the distribution system to stores, and ultimately to the consumer. The simplicity of the process may be somewhat deceptive since there is a tremendous amount of “cereal chemistry” knowledge involved. It didn’t take long for me to get over my disillusionment about the puffing guns, and I developed a high level of respect for the science that goes into this cereal-making process.